The English call it roast beef, and for untold generations, a rib roast rotating on a spit in front of a wood fire has represented not just gustatory bliss, but material and spiritual comfort. So essential is roast beef to the British sense of well-being, a special breed of dog was developed in the sixteenth century to turn a treadmill attached to the rotisserie spit. (Before that, the task fell to miserable scullery lads, and later, elaborate clockworks.) You’ve probably had prime rib cooked in the oven. Spitroasted next to a wood or wood-enhanced fire, prime rib is nothing less than a revelation. 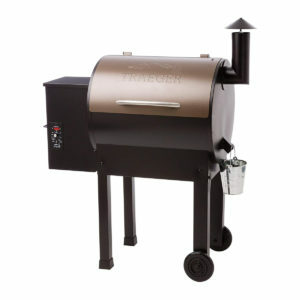 Equipment: You’ll need a grill with a rotisserie. If you’re lucky enough to own a wood-burning rotisserie (like a Kalamazoo), you can smoke the prime rib while you grill it. 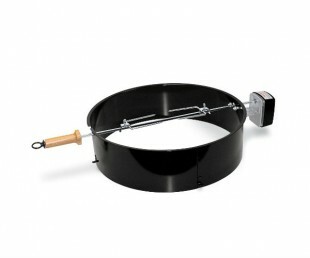 Ditto for a charcoal-burning rotisserie, like a Weber kettle. 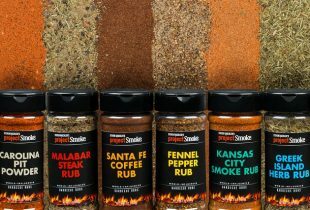 You can even add a little smoke flavor on a gas grill (see page 22). You also need butcher’s string; 2 hardwood chunks or 1½ cups wood chips (optional), the latter soaked in water to cover for 30 minutes, then drained; an instant-read thermometer; and heavy-duty grill gloves. Step 1: Set up your grill for spit-roasting and heat to medium-high. Place a large drip pan below the center of the spit (to collect meat drippings for the Horseradish Cream). Step 2: Using the tip of a paring knife, make a series of slits in the roast on all sides. Each slit should be about ½ inch wide and deep and spaced 1½ inches apart. In half the slits, insert sprigs of rosemary, and in the remainder, insert garlic slivers, taking care to intermix the flavorings. Generously—and I mean generously—season the roast on all sides with salt and pepper, patting the seasonings into the meat. 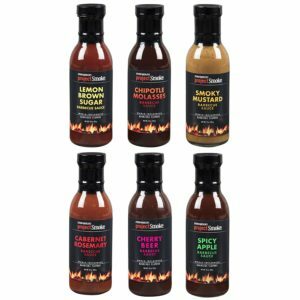 Drizzle oil over the meat, rubbing it in with your fingertips. Step 3: Using butcher’s string, tie the roast between the bones. (This keeps the collar of the meat from separating from the eye of the roast.) Wrap the string around the roast end to end to give it a compact shape. Step 4: Slip the first pronged fork on the spit. Thread the roast from end to end on the rotisserie spit and secure it with the second fork. Tighten the lock screws between the tines of a table fork. Fit the end of the spit in the motor socket. If your rotisserie kit has one, adjust the counterbalance to ensure the meat spins smoothly (it shouldn’t wobble or seize during the rotation). If using wood chunks or chips on a charcoal grill, add them to the coals. On a gas grill, place the chunks on the metal heat diffuser over the burners. Step 5: Spit-roast the prime rib until crusty and brown on the outside and cooked to the desired degree of doneness on the inside, about 1 hour for rare (120° to 125°F); 1¼ to 1½ hours for medium-rare (130° to 135°F). Pause the rotisserie and use an instantread thermometer inserted into the very center of the prime rib (through the large end but not touching the rotisserie spit or bone) to test for doneness. Remember, the prime rib will continue to cook even after it leaves the rotisserie. Step 6: Turn off the rotisserie motor and remove the spit from the rotisserie socket. Supporting the spit with both hands (heavy-duty grill gloves, please), transfer the roast to a large cutting board (preferably with a deep well around the periphery to collect the juices). Carefully remove the roast from the spit. Remove the butcher’s string and let the prime rib rest for 5 minutes or so, loosely tented with aluminum foil. Step 7: Meanwhile, make the Horseradish Cream. Step 8: To carve the prime rib, remove the bones in one piece with a sharp knife following the curve of the meat. Set aside the bones for yourself or divvy among other lucky diners. Carve the roast crosswise into ¾-inch-thick slices and serve with the Horseradish Cream. NOTE: Some folks like their prime rib well-done. Serve them end cuts. SHOP: Paradoxically, not all prime rib is Prime (the majority of it is graded Choice). But either grade delivers beef in one of its most magisterial forms. There are 7 bones to a full prime rib (which will easily feed 14 to 16). 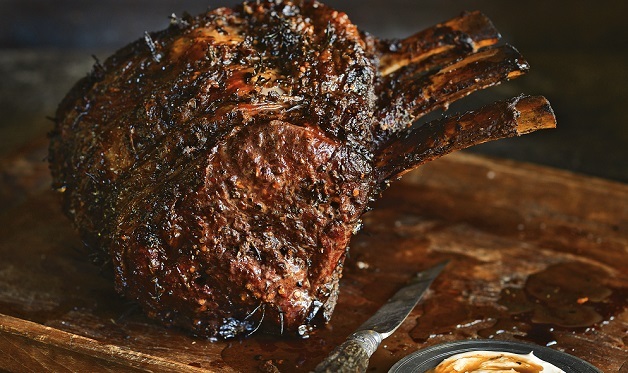 A 3-rib roast makes a good compromise between grandeur and affordability. Ask your butcher to “french” it, that is, carve away the fat from the last inch or two of each bone. crusty bones, sizzling fat, and sanguine beef—spit-roast it on a rotisserie. 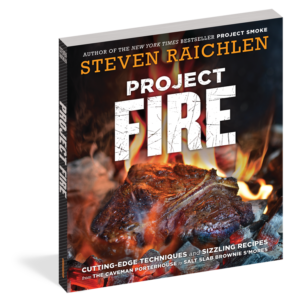 This gives you the searing and browning of direct grilling with the constant gentle heat of indirect grilling, and the slow and steady rotation bastes the beef both externally and internally. Try this with some barbecue buddies sometime: Have one smoke a prime rib; another indirect grill it; and yet a third spit-roast it. Taste them side by side (preferably a blind tasting) and I bet you’ll find the spit-roasted version wins every time.